Michael Douglas's parents divorced when he was six, and he was raised primarily by his mother, actress Diana Douglas, and her subsequent husband, novelist Bill Darrid. At 22, Douglas made his film debut with a bit part in his father Kirk Douglas's Cast A Giant Shadow. He was in his mid-20s before he began getting movie and television roles, and he perplexed his agent by insisting on off-beat parts. He was 28 when he took the young sidekick role opposite Karl Malden's veteran cop in The Streets of San Francisco. Kirk Douglas owned the rights to One Flew Over the Cuckoo's Nest for many years, but had been unable to get the film made, and by the early 1970s he felt too old to play the lead. So father handed the property off to son, and as producer of the film, starring Jack Nicholson, Michael Douglas won the 1975 Oscar for Best Picture. Douglas has remained active as a producer, mostly of films he has starred in. 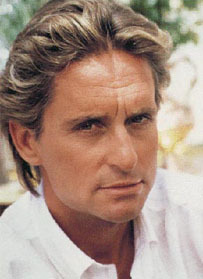 After a few routine leading man roles, Douglas became a major star with Romancing the Stone, but almost immediately he seemed to gravitate toward off-kilter roles again. In Fatal Attraction, he played the philandering husband pursued by a maniacal Glenn Close, and it was a box office hit, but sensitive feminists complained that the film had a misogynist streak. In Wall Street, he played the arch-capitalist Gordon Gecko, and voiced perhaps his most famous scripted line, "Greed is good" (and won the Oscar for Best Actor). Black Rain was a straightforward action film, with Douglas as an American cop tracking the Japanese Mafia to Osaka. Douglas then starred in the merciless divorce comedy The War of the Roses with Kathleen Turner, and the cop thriller Basic Instinct. In Falling Down, he played a laid-off defense worker having a very bad day, and getting into situations that some audiences grumbled were anti-anything but white, straight, and crew-cut. Disclosure was a drama about sexual harassment with the roles reversed, and Demi Moore harassing Douglas, leading to renewed complaints of sexism. Despite the grumbling of audiences waiting to be offended, a good actor taking challenging parts -- and most of his films, including the "controversial" titles, have been entertaining, well-reviewed, and well-received. He has also appeared in more mainstream roles as The American President with Annette Bening, or the Drug Czar in Traffic. There has been no press release announcing it, but observers say they have seen the tell-tale scars of plastic surgery on Douglas, who is now in his 60s. And in 2000, he re-entered "creepy" territory by divorcing his wife of 23 years to marry 31-year-old Catherine Zeta-Jones, a marriage in which Douglas is older than his father-in-law. Patricia Erens, The Jew in American Cinema (1984), page 383, states outright that he is Jewish. His father Kirk Douglas is Jewish, though mother Diana Dill is a WASP. Michael Douglas is known to be a supporter of the Jewish National Fund, a fact we note although it is inconclusive as to his religious identification. Douglas is also listed in Klein and Vuijst's The Half-Jewish Book (2000).